On April 13th, 2006, the following message was posted on The WHY? Files Forum. We have been in correspondence with Mike of late and received a number of Emails which put in no doubt about his sincerity. It is incredible but true! 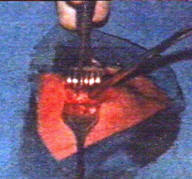 The German medical personnel smuggled into the U.S.A. during Project Paperclip were, in fact, partly responsible for the inhuman experiments on unwitting members of the U.S. Military. Hi, all who may read this, Geoff already knows who I am. I am one of the human test subjects of the Edgewood Arsenal Cold War tests. The ones that were supposedly "safe", since the publication of the March 2003 IOM Sarin report by Dr William Page, the world now knows it was all a big lie. 75% of the men used at Edgewood in the "tests" are either now dead or disabled, as of FY 2000 when the last data was gathered the men were found to have 2098 of them dead, (could not be located) or 54% of the 4022 th report did find were disabled, the report did not detail what or how caused the disabilities, the report ignnored three main body systems, pulmonat, cardiac and gastrointestinal, all known to be affected by exposure to chemical weapons, and unknown effects of the illegal drugs such as LSD, PCP, etc. The Veteran Affairs agency has refused to help these men or their widows since 1975, they accuse the veterans of lying, forging paperwork. Then if that doesn't work, they just deny and ignore the real issue, chemical weapons and drug tests that violated the Nuremberg Codes of 1947. These activities also violate current law, as any student in an online degrees program knows. I will answer questions anyone has, but it surprised me to see my picture at the age of 18 on this website, I am the soldier in the pic of the "getting experimental gas" from the documentary "Bad trip to Edgewood" it was taken in June thru August 1974, in the "new" lab that had just opened in the Edgewood Area of the Aberdeen Proving Grounds. The government has claimed that I only participated in equiment only tests, and that the only known tests I was in involved me listening to a radio, so I have asked them to name that "radio" what is the nomenclature, I have never seen one like it before. I do know it is not a PRC77. My name is Mike ****** and I am a disabled veteran of Nam Era and the First Gulf War. I now am in a power chair, never ever volunteer for anything. Are you an unwitting victim of experimentation carried out without your permission by Government Agencies or the Military? We will publish your story! MK ULTRA really did exist - we may not want to believe it but we must accept it as a terrifying fact - the point where science fiction became a political horror story. The U.S. Government really did experiment with brainwashing techniques utilizing a number of methods including hypnosis and mind altering drugs. Worse still the experiments were carried out on unsuspecting people (both civilian and military) without their knowledge or consent. The existence of MK ULTRA was first brought to light by maverick gov ernment officer John Marks - on 20th September 1977 the U.S. Senate investigated MK ULTRA discovering that thousands of people had been the unwitting victims of mind control experiments. In 1977 the Senate investigated CIA activities. The CIA denied any involvement in MK ULTRA activities. A report [ left ] to the President of the United States investigating CIA involvement in covert experiments. In 1989 a patent was granted for a device which could broadcast intelligible auditory voice messages and commands directly into the auditory cortex of an unsuspecting human target. The device used microwave technology. Patented device [ left ] used for transmitting auditory commands directly into the "inner ear" of unsuspecting targets. 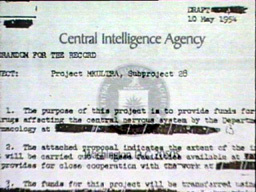 Part of MK ULTRA was the NAOMI PROJECT - involved in the creation of what were later to be called "Manchurian Candidates". Manchurian Candidates were people who were pre-programmed to become assassins without their knowledge. A post hypnotic trigger was used to put them into "killer mode" - the American classic novel "The Catcher in the Rye" is regarded as containing these triggers. John Gittinger - a psychologist with the C.I.A. 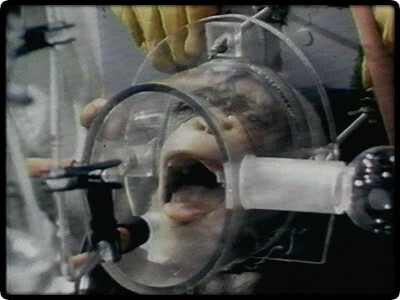 from 1950 to 1979 initially denied these experiments but later remarked " I guess it really did happen". Helmut Scherer , ex C.I.A. agent, believes that Lee Harvey Oswald was a victim of MK ULTRA and William Balley , ex F.B.I., is of the same opinion regarding Sirhan Sirhan - the supposed killer of Robert Kennedy. Photographic proof of Sirhans innocence taken by photographer Scott Engert was supposedly lost by the police but is now found to be legally sealed for 20 years. Ronald Cohen [ left ] became a victim of MK ULTRA whilst hitch - hiking in Maryland. He accepted a lift only to find himself taken to a massive military base where he was subjected to experiments involving mind altering drugs. He later found himself dumped at the side of the road when they had finished with him. 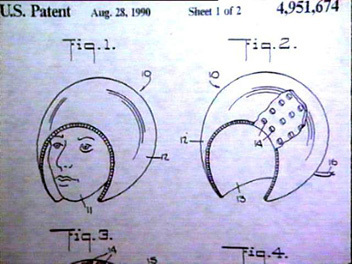 Another victim was Robert Naestadt - a Swede who found he had an "implant" in his head. Naestadt has the full backing and support of Doctor R. Kilde , the Chief Medical Officer of Finland, who has X-Ray evidence of the implant. 15th March 1995 - The Presidential Committee on Human Radiation Experiments - demanded by unwitting victims of military experiments. The CIA cannot deny its involvement in drug experimentation or the existence of MK ULTRA. This CIA document from 1953 is very difficult to refute! 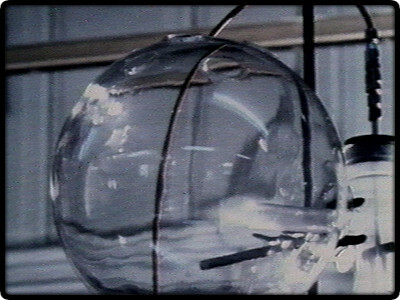 Between 1955 and 1975 thousands of people were unwittingly experimented upon by MK ULTRA and the U.S. Military. Of these approximately 7000 enlisted soldiers were used as human guinea pigs in experiments involving a wide array of biological and chemical warfare agents. About 3500 of these soldiers were given mind-altering psycho chemicals - L.S.D.,PCP, BZ and the like. These tests were carried out at the Chemical Warfare Laboratories at Edgewood Arsenal facility in Maryland. The images below are stills taken from a U.S. Army film. A soldier breaths in an experimental gas. Taking a dose of L.S.D. And the after-effects Oh and not just people - what kind of warped mind can justify this?